In this way, the pilot discovers that the planet the little prince is from is no larger than a house. He believes that the planet the little prince comes from is knows as asteroid B-612, first discovered by a Turkish astronomer in 1909. This discovery was dismissed at first, however, due to the fact that the astronomer wore a Turkish costume at his presentation. When the astronomer then made the same demonstration wearing a European costume in 1920, everybody accepted his report. The grownups make many surface assumptions that cause them to miss important points (like the discovery of B-612). They reveal how narrow-minded they are, and how biased, when they dismiss an exciting report based on surface details such as the astronomer's appearance. The adults also don't seek to explore further—either literally or figuratively. The pilot explains that he tells us of these details about the asteroid because of the grownups and their ways. They don't ask about a friend's personal qualities, but about figures like weight and the income of his parents. The pilot says that grownups can't help it, however, and that children must always be very patient when dealing with them. The pilot complains again that grownup miss the important points. They get caught up in appearances and surface details instead of exploring the truth that lies beneath. The pilot says that for those who truly understand things, figures are of no consequence, and that he would have been better off starting his book by writing: "Once upon a time there was a prince…" He wants to make sure no one reads his book carelessly, for he has suffered in setting down his memories, and he wants to be able to remember his friend—for not everyone has had a friend. If the pilot forgets his little prince, he says, he may become like the grownups, who are interested in nothing but figures. The pilot hints at the main lesson of the novella—that the friendships we form with others are the most essential part of life. Grownups, however, miss this important part too, when they get caught up in figures, which the novella implicitly connects not with life but rather mere survival or getting by. The pilot apologizes for his drawings, which he says are sometimes good and sometimes bad. He says that he may make some other mistakes too, for he is perhaps a little like the grownups and has not been able to stop himself from growing old. The pilot acknowledges that he's lost some of his innocence with age, and consequently, some of his ability to perceive what's truly important in life. Cao, Diana. "The Little Prince Chapter 4." LitCharts. LitCharts LLC, 17 Nov 2013. Web. 19 Apr 2019. Cao, Diana. "The Little Prince Chapter 4." LitCharts LLC, November 17, 2013. 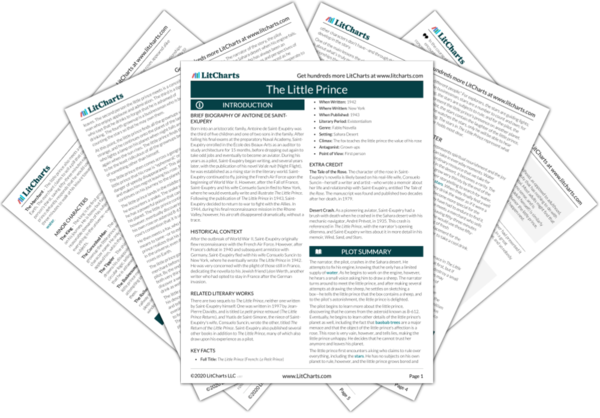 Retrieved April 19, 2019. https://www.litcharts.com/lit/the-little-prince/chapter-4.